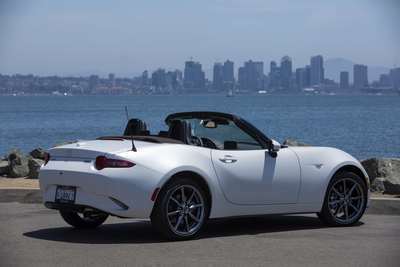 WASHINGTON, DC (February 8, 2019) – Mazda North American Operations (MNAO) announces the Mazda MX-5 Miata has won the 2019 MotorWeek Drivers’ Choice Award for Best Convertible for the second consecutive year. The Mazda MX-5 Miata is a symbol of Mazda’s car-making philosophy and tireless pursuit of driving pleasure. As a result of numerous changes, the 2019 MX-5 is quicker, more responsive and aims to be more engaging to drive, adhering to Mazda’s unique Jinba Ittai —“horse and rider as one”—engineering philosophy. For 2019, the MX-5 gains a new SKYACTIV-G 2.0-liter engine, increasing the horsepower by 26 and further improving its performance, response, feel, and efficiency. Additionally, the MX-5 receives advanced safety features from Mazda’s i-ACTIVESENSE suite of technology including a standard rearview camera and available Smart City Brake Support, Blind Spot Monitoring with Rear Cross-Traffic Alert, Lane-Departure Warning System, and Adaptive Front Lighting System. The Mazda MX-5 Miata debuted at the Chicago Auto Show in 1989. Now, 30 years later, Mazda proudly made another debut at the Chicago Auto Show with the world premiere of the 2019 Mazda MX-5 Miata 30th Anniversary Edition. The special edition is meant to commemorate all of its milestones and the important people that have been part of its special journey, especially Mazda’s enthusiastic fans. The first noticeable new feature is the exclusive Racing Orange exterior paint color. This strikingly vivid color pays homage to the yellow MX-5 Miata Club Racer that also debuted at the 1989 Chicago Auto Show. Racing Orange is meant to represent sunrise and anticipation, while staying true to the characteristics of a pure sports car. More detail and preorder information are available at https://www.mazdausa.com/30th-anniversary. MotorWeekis television’s longest running and well-respected automotive series. Debuting in 1981, MotorWeekbecame the first series to offer consumer-oriented car and truck reviews and the latest automotive industry news. For the past 38 years, MotorWeekhas looked at the automotive landscape and awarded Driver’s Choice Awards based on buyer’s point-of-view. Mazda North American Operations is headquartered in Irvine, California, and oversees the sales, marketing, parts and customer service support of Mazda vehicles in the United States and Mexico through nearly 700 dealers. Operations in Mexico are managed by Mazda Motor de Mexico in Mexico City.